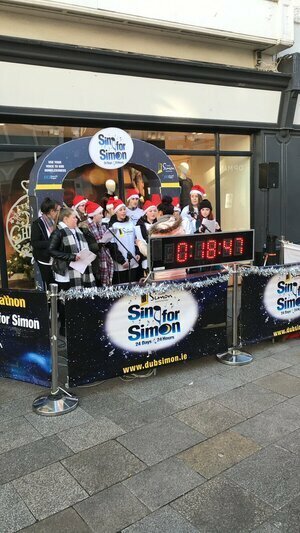 Posted in Misc and tagged 24 hour carols, Dublin Simon at 1:55 pm on December 15, 2017 by Bodger. ‘Sin for Simon’ and that Santa. Well those that are helping will be attacked by the blushirts for being part of the “homelessness industry” and they are helping to exacerbate the problem by helping to keep homeless people alive..
There’s me thinking I was going to be smart asking why they are requesting we ‘sin for Simon’. Guess I’m not as unique, clever or elastic as I had thought. I was thinking the same thing. Except for the elastic. Dublin Simon had a budget of €18 million this year and that’s the best they can do? Even the domain name is amateur hour. 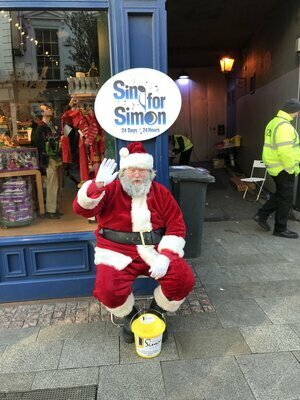 Well BUCKO as someone who has donated €300 to Simon this year – that is a whopping €25 per month – I for one am pleased that the money was not spent on a flashy domain name. So good on them. What song would you like to hear being sung for Simon Coveney?…. I would like to hear __________ sung for Simon Coveney because __________ . For the top three winners voted by you the BS readers that are clever or funny while being fair comment at the same time…. I will continue to give all my spare change out to the poor and unfortunate people sleeping rough, begging, desperate for change to buy alcohol or drugs while trying to keep warm on our freezing city streets.